Peruse my photographs, original and altered, scratchboard and fabric art, and link to my gallery page where you can purchase prints. 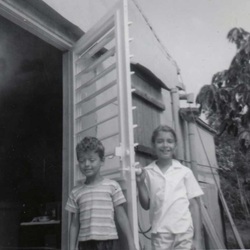 When my brother Ricardo and I were young, although we both read voraciously, and both explored and experimented with the many art supplied and techniques my mother provided us with, we each had a main passion that was our creative focus. I wrote, and Ricardo made visual art. It took us until our middle ages to venture fully into what we had come to think of as each other's turf. Ricardo now writes prolifically, and I take my artwork seriously, exploring new materials and forms with delight. I've always drawn, made collages, and eventually extended that form into assemblage, the three dimensional collaging of objects, and fabric art that incorporates photographs, beads, printing, dyeing, appliqué and other interesting things. In recent years I've discovered a love of photography and the adventurous practice of altering photo images into digital art. I've also taken up Ricardo's art form of scratchboard, which gives lovely woodcut-like effects without the carpal tunnel issues of carving actual wood, and with a much more forgiving material. My mother was, among many other things, a fiber artist, experimenting with quilting, reverse appliqué, embroidery, knitting, crochet and much more. Like my mother, I may admire traditional quilts, but don't have the patience to assemble them. I prefer free form art quilts, and a wild blending of materials and styles. In the last couple of years I've been using plant dyes to color silk, and love the unpredictability and serendipity, since I am not interested in tracking exactly how I get each tint. I love that a spoonful of vinegar can turn the brilliant magenta of cochineal into a cherry red, while a spoon of washing soda will turn it grape purple. I love dipping and dipping again, twisting and ribber-banding fabric to create patterns that sometimes resemble fossils, or the whorls in wood. Recently I've been concentrating on digital art, layering and manipulating photographs to create my own new images. I stalk textures with my camera, capturing the lace of tree branches, reflections in puddles, odd cloud formations and metal gratings or weathered wood, turning them into tapestries that look nothing like the originals. Click below to see more of my work at Fine Art America.